Courtroom E-201 Supporters and journalists encouraged. The More 4 Mann Coalition of Historic Africatown (in Central Seattle) is continuing to challenge the unconstitutional “EXCLUSION NOTICE” imposed upon three of our members by the Seattle Public School District since last November, in direct violation of the First Amendment. The three members, Omari Tahir, Greg Lewis and Leight J-K, appealed this decision to the King County Superior Court. Judge Prochnou will hear the appeal at 9 a.m. Friday, July 25, in Courtroom E-201, at 516 3rd Ave.. The Exclusion Notice bans the three members of the More 4 Mann Coalition from any and all public meetings and community events held on any SPS property for one year. Former Seattle Public Schools social studies teacher Omari Tahir has served as the elected co-chair of the Seattle Alliance For Black Education since 1970. Greg Lewis is a martial arts and fitness instructor. Leith Jasinowski-Kahl is a local longshoreman and community activist who has served as a member of SPS’s Horace Mann-African American Community Partnerships Task Force since August 22, 2013, at the request of outgoing Superintendent Jose Banda. In September, that task force reached overwhelming joint District-Community agreement on thirteen (13) clear recommendations (attached), which the More 4 Mann Coalition continues to support. 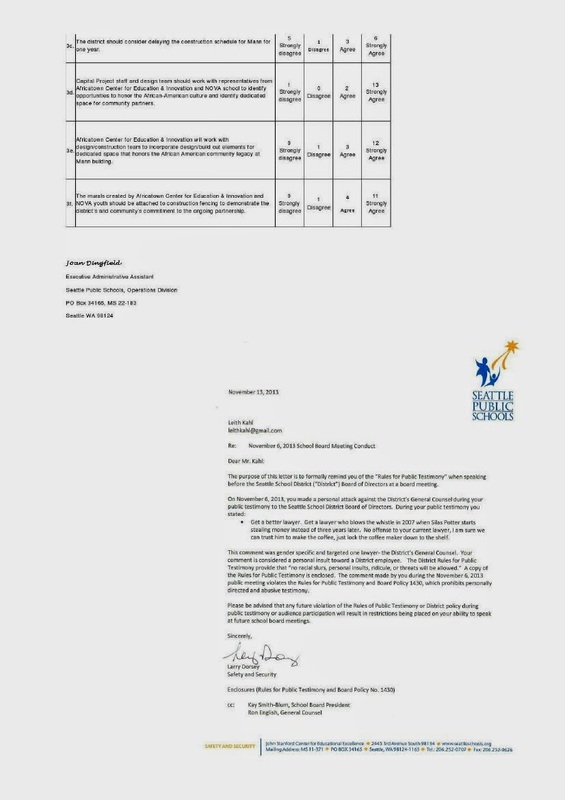 We believe this perverse and backward “Exclusion Notice” to have been concocted by loyalists of SPS General Council Ron English, and his old-guard faction within the School District. This is the same School District (and Ron English faction) that has always welcomed the infamous former Urban League chief James Kelly into its facilities, even after he brought a firearm onto Rainier Beach High School campus and publicly threatened people with it in May of 2002 (http://www.seattlepi.com/news/article/City-right-to-bring-charge-in-gun-case-1091852.php ). Last Autumn, Ron English sabotaged the Superintendent’s pragmatic efforts at multicultural dialogue, and abruptly shifted the District’s tone and policy. In early November, the District suddenly and unilaterally began addressing the More 4 Mann Coalition as “tresspassers” instead of Partners. The District also sent a letter to task force member Leith Kahl, threatening to exclude him from Board meetings if he so much as mentioned Ron English by name, title, or pronoun (also attached). The Ron English machine is using District Exclusion Notices and Seattle Police to silence its critics because it does not want Seattle’s taxpayers to pay attention to the record of Ron English’s involvement in the 1986 through 2005 process of privatizing Queen Anne High School (http://seattletimes.com/html/education/2002440838_queenanne15m.html ), the illegal 2003 “transfer” of the African American Heritage Museum & Cultural Center’s Coleman School Building to the Seattle Urban League (http://www.aahmcc.org/a-brief-history/ ), the theocratic 2010 giveaway of MLK High School to a religious institution (http://seattletimes.com/html/localnews/2015242396_mlk06m.html ), and the Seattle Public Schools Small Business Contracting Program Scandal of 2011 ( http://seattletimes.com/html/localnews/2014375410_potter03.html ). A thorough review of this long related train of abuses and usurpations would lead most taxpayers to conclude that Ron English is not a good steward of public resources, and that he should, at the very least, be let go from his job at SPS. The District still had yet to implement any of these task force recommendations by November 19th, when a Seattle Police SWAT Team raided the Mann building at Ron English’s desire, arresting Leith, Omari, Greg and one random bystander who was not a Coalition member. They were each issued the District’s one year Exclusion Notice at the time of their release the same day. Not a single task force recommendation had yet been implemented by December 12, when we appealed the Exclusion Notice within the District’s internal Kangaroo “appeal procedure”, where it was of course upheld by THE SAME PERSON WHO HAD WRITTEN IT IN THE FIRST PLACE. Not a single recommendation had been implemented by December 19th, when we appealed this matter to Superior Court. Since then, we are happy to report that at least ONE important task force recommendation was achieved, when SPS signed an interim re-location lease agreement with one of the More 4 Mann Coalition’s affiliated organizations. However, to date, less than four out of the thirteen task force recommendations have been achieved. The programmatic and visual presence of ALL Africatown activities have been, at least temporarily, displaced from 2401 E. Cherry Street, the historic heart of Africatown. This was the opposite of both the letter and spirit of the task force’s recommendations, and of the School District’s stated intent in convening that task force. Our attorney will therefore ask the Superior Court to quash this unlawful exclusion notice. Categories Event, Race, What's happening in Seattle?